Reporters Without Borders (RSF), an organisation that defends press freedom worldwide, has rallied to the aid of Raja Petra Kamaruddin (RPK), Malaysia's renowned blogger. Secretary-general of RSF, Jean-François Julliard, wrote in February to Tuanku Mizan Zainal Abidin Ibni Almarhum Sultan Mahmud Al Mukhtafi Billah Shah, the king of Malaysia, asking him to intercede in RPK's case. 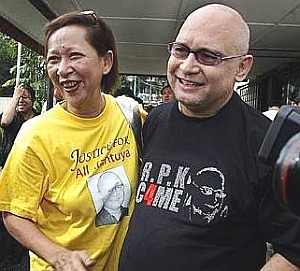 The way the federal court in Putrajaya is conducting RPK’s case is travesty of justice. The court’s impartiality is jeopardised by the fact that Augustine Paul, one of the three judges on the panel handling the case, issued a ruling against RPK in 2001 as a “threat to internal security.” RPK had posted comments online that lambasted the judge for his role in Anwar Ibrahim’s corruption trial – comments that were widely circulated on the Internet. Malaysia has ratified the Universal Declaration of Human Rights, so such violations of freedom cannot continue. This situation threatens the rule of law in Malaysia and offers an extremely negative image of your country internationally. In the current context, it seems clear that this is a political manoeuvre to silence RPK and put pressure on Malaysia’s civil society leaders. Anyway, I know for a fact that it was not Prime Minister Abdullah Ahmad Badawi who ordered my detention. He was not even aware I had been detained. The order came from Deputy Prime Minister Najib Tun Razak and since I am bent on making sure he never becomes Prime Minister on 1 April 2009 I really do not blame him for wanting to get me out of the way. My friends and family want me to leave the country and to seek political asylum in another country. They feel I can still continue with the struggle in a foreign land. But I am against that as much as my wife pleads that I consider this. I am no quitter and I do not run. I shall stay and fight till the very end even if that is the last thing I do. If I have to lose my freedom so be it. That is the price we pay for opposing the powers-that-be. But I shall not go quietly or make any deals to secure my release with those who walk in the corridors of power. These writings came a few days before the Federal Court recently dismissed the application by the Malaysia Today editor to recuse Justice Datuk Augustine Paul from hearing his habeas corpus appeal. Justices Datuk Nik Hashim Nik Ab Rahman and Datuk Zulkefli Ahmad Makinuddin in their decision said they were satisfied that the application to recuse Paul was made without any merit. This is notwithstanding, Malik Imtiaz Sarwar, counel for Raja Petra, having pointed out that RPK had criticized Paul in his role as the High Court judge in Datuk Seri Anwar Ibrahim's corruption trial in 1998, and as the High Court judge who had dismissed RPK's habeas corpus application in 2001 (the Federal Court later released him). “My client has consistently questioned Justice Paul's integrity. And now the judge is sitting on his case.” Malik was reported to have said. The court, after dismissing the recusal application, invited Paul to join the panel to hear three other applications by Raja Petra. Raja Petra had applied for a panel of five or seven judges to hear the appeal on the ground that the case involved complex constitutional issues. The application was dismissed. His applications to adduce in the appeal his supplementary affidavit as well as the notes of proceedings of his on-going sedition trial, to which deputy public prosecutor Tun Majid Tun objected, were also dismissed. Malik Imtiaz, who also has wide readership for his legal and political blog, “Disquiet“, also informed the court that Raja Petra wanted to withdraw the cross-appeal. The criminal defamation charges trial against RPL will commence at the Sessions Court on May 26, 2009. Three days have bee set for the trial, with a reported eight witnesses to be called. RPK is alleged to have defamed the deputy prime minister's wife, Datin Seri Rosmah Mansor, Lt-Col Norhayati Hassan and her husband, Lt-Col Abdul Aziz Buyong, by making a libellous statement in a declaration. well, our judiciary is still corrupted. the decision on the v k lingam video clip is still a good example. the macc and the ag chambers, have not charged the six and they as in the macc and ag say there is no case against them. how come this can happen when they had so much evidences and they claim no case. i remember a middle age indian lady coming and giving explosive revelations and you mean to say that is no evidence. she talked about a 10million case in a defamation suit which her boss itself prepared when the judge was suppose to write the judgement. the air tickets, photographs and etc etc, as i wagely remember. so do you think there will be proper judgement in other cases. please dont get carried away. we have to have a strong new opposition, and thats when we can have independent of everything. Sooner or later these judges and their wives and children, will be reading about what the public thinks about them. They have to look at the mirror and ask themselves if they did the right thing or what someone thought was right. The law of karma will eventually prevail, that I am sure about.